Samantha Franklin (from left), Ph.D. (B.S. ’10), former Assistant Professor of Physics and Environmental Science, and Melanie Call, St. Mary’s Associate Executive Director of Development, played for the Alamo City Roller Girls (ACRG), San Antonio’s women’s roller derby team, in a March bout against the Yellow Rose Derby Girls from Fulshear. This was Melanie Call’s nonchalant response after receiving a busted lip playing for the Alamo City Roller Girls (ACRG), San Antonio’s women’s roller derby team. The hard-hitting sentiment from Call, St. Mary’s University Associate Executive Director of Development, was shared by Samantha Franklin, Ph.D. (B.S. ’10), who until recently was a St. Mary’s Assistant Professor of Physics and Environmental Science and was Call’s teammate on ACRG, a nationally recognized league for the Women’s Flat Track Derby Association. Call and Franklin skated together under their derby names Violet Protest and Doc Slaughter, respectively, before realizing they both worked at St. Mary’s at the time. “It’s a part of me that no one really knows unless they go watch me play,” she said. 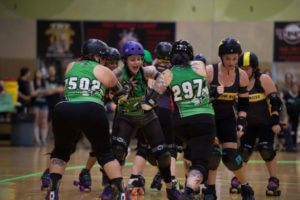 The sport is played in roller skates on an oval track with a squad of five players from each team — a jammer and four blockers — playing in two-minute segments. In two 30-minute halves, jammers compete to score by passing opposing blockers, through onslaughts of body checks and elbows. Call, a jammer, who has been adorned with finger splints and bruises at times, said it’s a great icebreaker in talking with potential and current donors and vendors for the University, while Franklin, a blocker, used roller derby as an example to talk about “impulse, momentum and collision” with her Physics majors. The volunteer-run ACRG also provides a sense of community that brings together women from diverse backgrounds. Call, the league’s president, leads the recruitment, training, marketing, sponsorships and community outreach. Eight years of experience on skates as a Sonic Drive-In server eventually led Call to derby. She tried out for ACRG in those same light-up Sonic skates. Now, she is Violet Protest, a twist on her favorite color, purple, and her political activism. Her number, 718, is her late mother’s birthday and has carried her through weekly practices and monthly bouts. 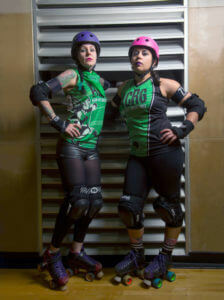 Roller derby’s given me the ability not to put limits on myself. And to encourage other people not to put limits on themselves, Call said. Franklin fights off roller derby opponents. Franklin’s journey to roller derby started with a love of ice-skating that transformed to roller skating after moving to Texas from Nebraska. On a Texas ice rink in her early 20s, she was discovered and recruited by a small, local derby team, which started her competitive hobby. She skated with ACRG last year and was known as Doc Slaughter, a pun based on her doctorate and her love for horror films. Her number, 1428, is derived from A Nightmare on Elm Street house address.